Jim & Jack Grillin' Basket: This is awesome, two true classics together at last. Jim Beam and Jack Daniels have teamed up in this delicious assortment of grillin' goodness. The delectable sauces and marinades will add zest to any steak or chicken cook out. Even those who don't drink will love the zesty flavor of Jim's rich salsa and creamy fudge. This is our absolute best seller! 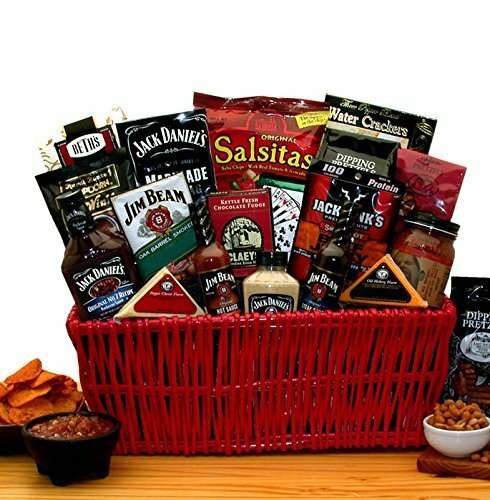 This Gift Includes: -Red Gloss Basket -Jack Daniels Barbecue Sauce -Jack Daniels Marinade mix -Jim Beam mustard -Jim Beam Hot Wing Sauce -Chocolate Truffle Gourmet Coffee -Irish Cream coffee -Jack Links Original Beef Jerky -Old El Paso Salsa -Pretzel sticks -3 Pepper Water crackers -Beth's Chocolate chip cookies -Tortilla Strips 8 oz -Chocolate Fudge popcorn 4 oz -3 oz Smokey cheddar cheese triangle -Clay's old Fashioned Fudge -Garlic Pretzel Nuggets -Grillin hot pad sets (Assorted Styles). This is awesome, two true classics together at last ! Makes a great Father's day, birthday, or holiday gift!